12x18 and 15x20 Cutting Board - Cal-Mil Plastic Products Inc.
Don't stray away from the classics! These cutting boards are designed for simplicity and effectivity. The cutting board is grooved to catch food runoff that would otherwise stain your food preparation areas, while the hole allows for easy transportation and storage. 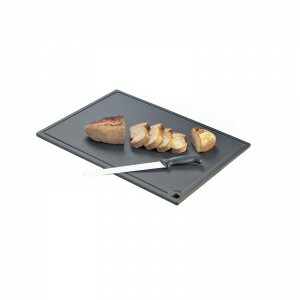 This cutting board is a perfect addition to any commercial kitchen or catering service.